BRIDGEWATER, N.J. — A spokesperson for the Wounded Warrior Project told LGBTQ Nation on Friday they had no record of any donations received from a New Jersey waitress who received thousands of dollars in extra tips and donations after she claimed she was stiffed by a family who left her an anti-gay note instead of a tip. 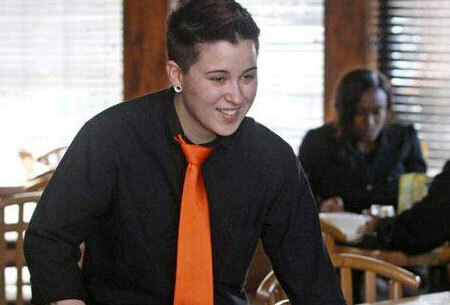 Dayna Morales, a server at the Gallop Asian Bistro in Bridgewater, N.J., said last month she was donating more than $3,000 to Wounded Warriors, a support charity for post-9/11 wounded veterans, after tips began pouring in from around the country on news of the homophobic note. But days after the news went viral, Morales’ story began to unwind. A New Jersey couple, who asked to remain anonymous, contacted WNBC-TV claiming that the story was a scam. The couple produced their receipt that was printed at the same time, on the same date, for the same amount, except with an $18 tip. They also produced a copy of a credit card bill supporting their claim they were charged for the meal plus the tip, a total of $111.55. A manager for the restaurant told LGBTQ Nation Friday that Morales remains suspended indefinitely, pending the results of its investigation. He declined to comment further or provide further details. Last week, former colleagues and friends reported Morales that has a reputation for lying. According to her former co-workers, Morales, an ex-Marine reservist, once told co-workers she was sent to Afghanistan and that everyone in her platoon died in an explosion — except her. A U.S. Marines spokesman later said “there is no indication of combat service in Iraq or Afghanistan” in Morales’ military record. A Pentagon source told LGBTQ Nation Friday that Morales had in fact been given an administrative general discharge for failure to appear at required monthly reserve drills. Morales could not be reached for comment, and has not spoken to the media since confronted by WNBC-TV with allegations that she fabricated the story.